Japan Farmers Markets: Motor Scooter Veggie Momma Video Up! 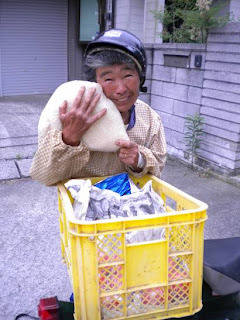 The story about the woman selling her vegetables via scooter was too good to just leave for one post and one photograph. Here's a video that really captures the whole experience - from her amazing cackle to the heft of that 18 kilograms of rice!